While life at Skylark has had one rather large upcoming event to focus on in April, I did not want to let the chance to talk about a cause near and dear to my heart pass by without mention. This Saturday, April 13, marks the day when people can celebrate the opening of many trails, including our own beloved Katy Trail, to the myriad of activities that make trails great. Just to name some: hiking, running, riding (bike and horse), skating, skiing, strolling, watching for wildlife and volunteering. For those of you who do not know, I spent nearly 25 years in Washington, D.C., and while there, I became affiliated with a great national organization called the Rails-to-Trails Conservancy (RTC for short). RTC helps advocate for groups that want to turn unused rail beds into walking, hiking and riding trails. They are currently supporting the effort of the Rock Island Trail organization, which, if the ongoing Missouri State Parks study finds in favor of and the trail is completed, the Rock Island and Katy Trails will form a 459-mile loop, unlike any other trail. 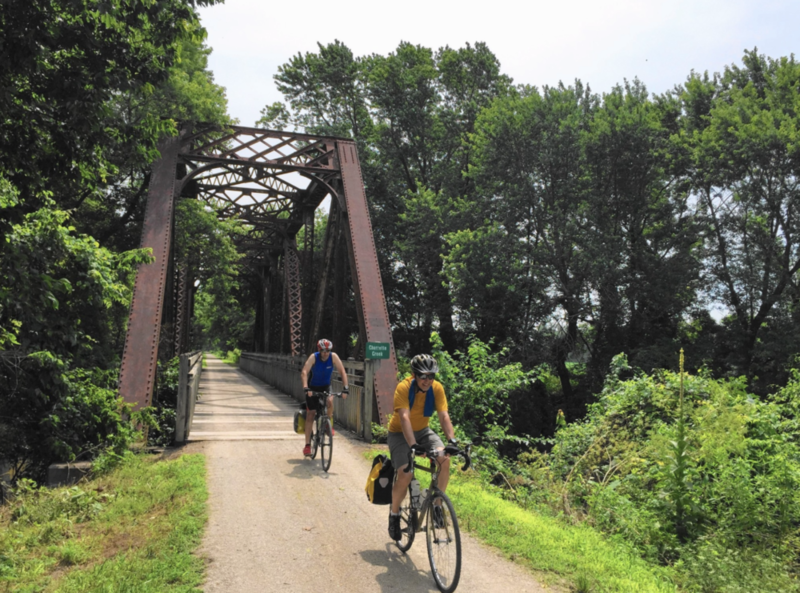 The Rock Island Trail would be boon to the smaller towns located along its route—you can read more about their efforts here. I attended a rally at the State Capitol in Jefferson City last year, and the enthusiasm of the towns was fantastic to witness, even early on a lousy weather day. So stop by the shop on Saturday morning if you can; I will be glad to chat more about RTC, the Rock Island Trail or just generally rave about trails.